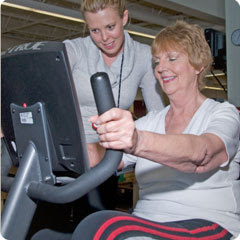 The aim of this prospective randomized controlled trial was to investigate if a short-term endurance or combined endurance/resistance exercise program was sufficient to improve aerobic capacity and maximum force in adult patients (18–65 years) with multiple sclerosis (MS). All patients performed a three-month exercise program consisting of two training sessions per week, lasting 40 min each, with moderate intensity. All patients had a maximum value of 6 (low to moderate disability) on the Expanded Disability Status Scale (EDSS). One group (combined workout group (CWG); 15 females, 4 males) completed a combined endurance/resistance workout (20 min on a bicycle ergometer, followed by 20 min of resistance training), while the other group (endurance workout group (EWG); 13 females, 5 males) completed a 40 min endurance training program. Aerobic capacity was assessed as peak oxygen uptake, ventilatory anaerobic threshold, and workload expressed as Watts. Maximum force of knee and shoulder extensors and flexors was measured using isokinetic testing. Quality of life was assessed with the SF-36 questionnaire, and fatigue was measured using the Modified Fatigue Impact Scale. Both training groups increased in aerobic capacity and maximum force. EWG, as well as CWG, showed improvement in several subscales of the SF-36 questionnaire and decrease of their fatigue. A short exercise intervention increased both aerobic capacity and maximum force independent of whether endurance or combined endurance/resistance workouts were performed.